The NYPD has rolled out a rainbow-colored SUV in support of the LGBTQ community and the victims of the mass shooting in Orlando last week. One of the department's patrol SUVs was re-outfitted with lights, decals and NYPD logos in rainbow colors. The department's usual "Courtesy Professionalism Respect" decal was replaced with ones that said "Pride Equality Peace," and another one was placed on a rear window that said "Our (heart) goes out to Orlando." 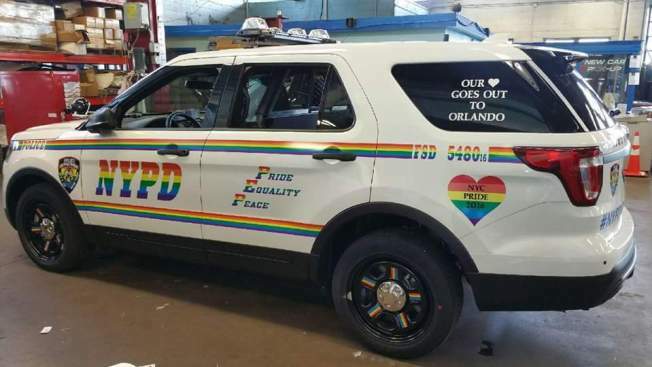 A photo of the vehicle first surfaced on the Orlando Police Department's Twitter feed Tuesday morning, along with the caption "Some love from the NYPD. Thank you All!" The department's Gay Officers Action League posted a video of the SUV Thursday morning. In the video, an LED ticker in the vehicle's back compartment lights up the phrases "Our hearts go out to Orlando" and "NYPD out and proud." An NYPD spokesman told amNewYork that the SUV was outfitted with the unique decals in support of the city's LGBTQ community and in solidarity with victims of the Pulse nightclub shooting. The vehicle is expected to make an appearance at Sunday's Pride March, which Mayor Bill de Blasio and Police Commissioner Bill Bratton estimate could be the biggest one ever. They say police security will be tight, with increased detail and measures both visible and non-visible. "This year is going to be a bit more somber, obviously, but I think more people will come out, they want to be together," said Dan Crowley, bartender at The Duplex, a popular cabaret and piano bar in Greenwich Village.